An Olympic hopeful stopped by to visit our Crabbs Cross holiday club children to put them through their paces this week. 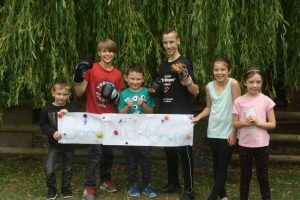 George Rowand, aged 13, gave the children a Thai Boxing masterclass on Monday 30th July, as a thank you to his former nursery as we are sponsoring him in his bid to reach the Paris Olympics in 2024. George, who is due to start at St Augustine’s Catholic High School in September, attended our Crabbs Cross Nursery and out of school club until 2017. 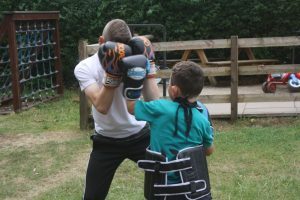 He discovered his love for Thai boxing at an early age and has attended Thaitans Martial Arts Academy in Redditch for the past six years. He is currently ranked the second-best junior in the UK for his age and weight. He has competed in several international competitions, including the WTKA World Championship in Italy, where he won two world titles, and the UKMF / IFMA World Championship qualifiers, where his talent was spotted and he was selected as part of Team GB for the year. He was also selected to take part in the IFMA World Championship in Bangkok, Thailand – and he jetted off on Wednesday 1st August to compete. George has been fundraising tirelessly to achieve all of this and we jumped at the chance to support him in his Olympic dream. 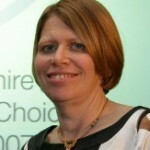 Anita Shepherd, Manager at Bright Kids Crabbs Cross, said: “We are thrilled to support George in his Olympic journey and couldn’t be prouder of his talent and all that he is achieving. To sponsor George email beccirowand@icloud.com or call 07873 898409.